Ambassador Tull Redmond is looking for a quick ride home back to Earth after ending her twenty-year mission as peace negotiator. All she wants is peace, quiet, and to be left alone. She boards the Earth Starship Giuseppe Verdi with its questionable leader, Captain Ben Jacobs anyway. It's the fastest way home. Her quarters has a full bath, a space view window, and a large, real bed! How bad could this rule-breaking, authority-defying Captain Casanova be? High Council hates him, true, but his crew loves him. Surely, she's too old and tired to be drawn into this bad boy of the quadrant's personal circus. Will Ambassador Redmond get the quiet, uneventful ride home she craves? Another outstanding book by Carol Ann Kauffman. 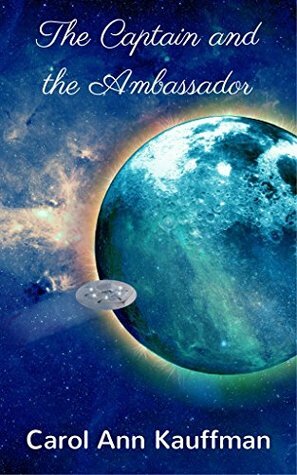 Though we haven't had much Sci-fi from this author lately, this book is perfect for fans of Firefly, Doctor Who and Star Trek, this story has everything we love about science fiction, with the familiar and outstanding storytelling we have come to know from Carol Ann Kauffman. Twists and turn keeps you turning pages, only to find more moments. I loved these characters, and they really come off the page as you keep reading. I highly recommend this! You don't need to read any other books before this one, so give it a chance! Again another scifi adventure, where your imagination take your readers to far away make believe places. Nice love story , interesting twists, nice ending. Good job, when is the next one coming!!!! !